Saudi Arabia with its capital Riyadh is located in Asia (Middle East, bordering the Persian Gulf and the Red Sea). It covers some 2,149,691 square kilometers (slightly more than one-fifth the size of the US) with 28,571,800 citizens. Arabic is the official language used in Saudi Arabia. Iraq, Jordan, Kuwait, Oman, Qatar, United Arab Emirates and Yemen are bordering countries. Saudi Arabia is a Middle Eastern country that occupies most of the Arabian peninsula and has coastlines on the Indian Ocean, Persian Gulf and Red Sea. Saudi Arabia is one of three countries named for their royal families, along with the Hashemite Kingdom of Jordan and also Liechtenstein. Entertainment in Saudi Arabia is very family-oriented. There are few activities for just couples or singles. Single men are not allowed in family areas: family beaches are partitioned from the bachelor beaches, for example. Women are expected to be accompanied by a male relative in public, although single women may be admitted into family areas. To reach someone Saudi Arabia dial +966 prior to a number. The local cellular networks are operated on 900 MHz, 1800 MHz, 3G, 4G. Websites typically end with the top level domain ".sa". If you want to bring electric appliances (e.g. battery chaarger), keep in min the local 230 V - 60 Hz (plugs: G). The sign for the locally used currency Rial is SAR. 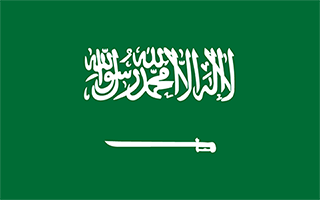 Green, a traditional color in Islamic flags, with the Shahada or Muslim creed in large white Arabic script (translated as "There is no god but God; Muhammad is the Messenger of God") above a white horizontal saber (the tip points to the hoist side); design dates to the early twentieth century and is closely associated with the Al Saud family which established the kingdom in 1932; the flag is manufactured with differing obverse and reverse sides so that the Shahada reads - and the sword points - correctly from right to left on both sides. Saudi Arabia is the birthplace of Islam and home to Islam's two holiest shrines in Mecca and Medina. The king's official title is the Custodian of the Two Holy Mosques. The modern Saudi state was founded in 1932 by ABD AL-AZIZ bin Abd al-Rahman Al SAUD (Ibn Saud) after a 30-year campaign to unify most of the Arabian Peninsula. One of his male descendants rules the country today, as required by the country's 1992 Basic Law. Following Iraq's invasion of Kuwait in 1990, Saudi Arabia accepted the Kuwaiti royal family and 400,000 refugees while allowing Western and Arab troops to deploy on its soil for the liberation of Kuwait the following year. The continuing presence of foreign troops on Saudi soil after the liberation of Kuwait became a source of tension between the royal family and the public until all operational US troops left the country in 2003. Major terrorist attacks in May and November 2003 spurred a strong ongoing campaign against domestic terrorism and extremism. From 2005 to 2015, King ABDALLAH incrementally modernized the Kingdom. Driven by personal ideology and political pragmatism, he introduced a series of social and economic initiatives, including expanding employment and social opportunities for women, attracting foreign investment, increasing the role of the private sector in the economy, and discouraging businesses from hiring foreign workers. Saudi Arabia saw protests during the 2011 Arab Spring but not the level of bloodshed seen in protests elsewhere in the region. Shia Muslims in the Eastern Province protested primarily against the detention of political prisoners, endemic discrimination, and Bahraini and Saudi Government actions in Bahrain. Riyadh took a cautious but firm approach by arresting some protesters but releasing most of them quickly and by using its state-sponsored clerics to counter political and Islamist activism. The government held its first-ever elections in 2005 and 2011, when Saudis went to the polls to elect municipal councilors. In December 2015, women were allowed to vote and stand as candidates for the first time in municipal council elections, with 19 women winning seats. King SALMAN bin Abd al-Aziz Al Saud ascended to the throne in 2015 and placed the first next-generation prince, MUHAMMAD BIN NAIF bin Abd al-Aziz Al Saud, in the line of succession as Crown Prince. He designated his son, MUHAMMAD BIN SALMAN bin Abd al-Aziz Al Saud, as the Deputy Crown Prince. In March 2015, Saudi Arabia led a coalition of 10 countries in a military campaign to restore the government of Yemen, which had been ousted by Huthi forces allied with former president ALI ABDULLAH al-Salih. The war in Yemen has led to civilian casualties and shortages of basic supplies, which has drawn considerable international criticism. In December 2015, Deputy Crown Prince MUHAMMAD BIN SALMAN announced Saudi Arabia would lead a 34-nation Islamic Coalition to fight terrorism (it has since grown to 41 nations). In January 2016, Saudi Arabia executed 47 people on charges of terrorism, including Shia Muslim cleric NIMR al-Nimr. Iranian protesters overran Saudi diplomatic facilities in Iran to protest al-NIMR’s execution and the Saudi government responded by cutting off diplomatic ties with Iran. The country remains a leading producer of oil and natural gas and holds about 16% of the world's proven oil reserves as of 2015. The government continues to pursue economic reform and diversification, particularly since Saudi Arabia's accession to the WTO in 2005, and promotes foreign investment in the Kingdom. In April 2016, the Saudi government announced a broad set of socio-economic reforms, known as Vision 2030. Low global oil prices throughout 2015 and 2016 significantly lowered Saudi Arabia’s governmental revenue. In response, the government cut subsidies on water, electricity, and gasoline; reduced government employee compensation packages; and announced limited new land taxes. In coordination with OPEC and some key non-OPEC countries, Saudi Arabia agreed cut oil output in early 2017 to regulate supply and help elevate global prices.